There can be a tendency for wedding invitations to follow a similar path. White is the background colour of choice and even though there may be a few style or font changes, many cards could be interchangeable with others. Which is fine, because there is a functionality to wedding invitations that means they need to provide certain information, but many couples also desire to send a special invitation that will be remembered as being their invitation. 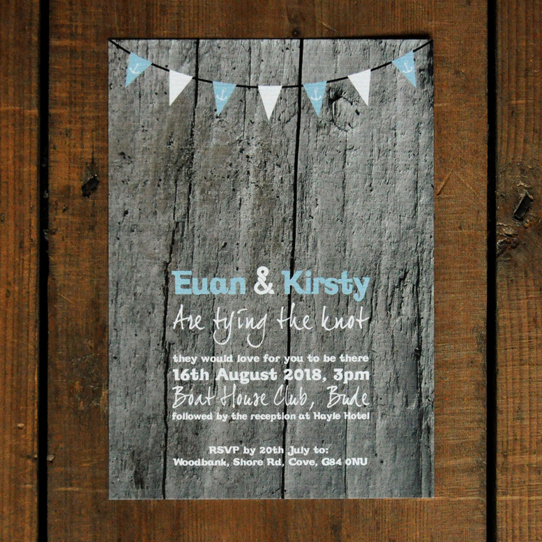 For couples looking for something slightly different from their wedding invitation, the Driftwood wedding invitation set from Feel Good Wedding Invites is exactly what they are looking for. This immediately doesn’t strike you as a wedding invitation with the stylish driftwood backdrop creating a different sense of style and atmosphere to the invitation. The bunting ensures people immediately know that a celebration is taking place and the font is clear and easy to read. There is plenty of space for information, so all of your guests will be fully informed about what your special day entails and if you are looking for additional stationery items, there is a full selection on offer with the Driftwood wedding invitation collection. With the chance to customise the colours of the bunting and writing, happy couples can still stamp their personal mark and style on their wedding invitation. The texture of the card many not replicate the sensation of driftwood but this is a card that is pleasant to touch and which will provide pleasure to a range of senses. Any couple that wants to send a wedding invitation that is a little out of step with the norm, but which is fun, functional and very stylish, will find that the Driftwood Wedding Invitation set is a fantastic choice to pass on the news about a very happy occasion. Tags: Beach, Bunting, Driftwood, Ocean.